When Christine Nurnberger joined SunGard Availability Services in 2012, Marketing and Sales were clearly out of alignment. Marketing’s contribution to the sales pipeline was less than 3%, even though they executed more than 1,100 marketing tactics over the previous fiscal year. By the end of 2013, that relationship had shifted dramatically. Marketing’s contribution to new revenue skyrocketed to 40% with the average deal size tripling. At MarketingsherpaEmail Summit 2014, Christine revealed her secret to success: smart content marketing built on intense research, analysis and creativity. It culminated with chief technology officers preparing for the zombie apocalypse and eager to engage SunGard. Part one was a direct-mail piece made up of a shadow box with a thumb drive, which included a personalized video announcing that, in the coming days, they would receive everything they needed to survive a zombie apocalypse. Part two was a zombie apocalypse survival kit — a backpack that included a copy of World War Z, two tickets to the movie and “zombie repellant,” aka silly string. The response blew the sales team away. Problems in your marketing can be tricky to identify. They might seem isolated, but they can also have a single root cause. Brian Carroll, Executive Director of Applied Research, MECLABS, believes a central problem for many B2B marketers is a lack of effective data. 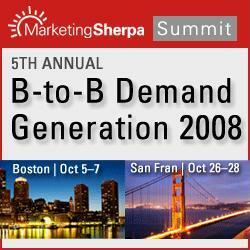 Carroll touched on this issue at the MarketingSherpa B2B Summit 2011 in San Francisco this week. 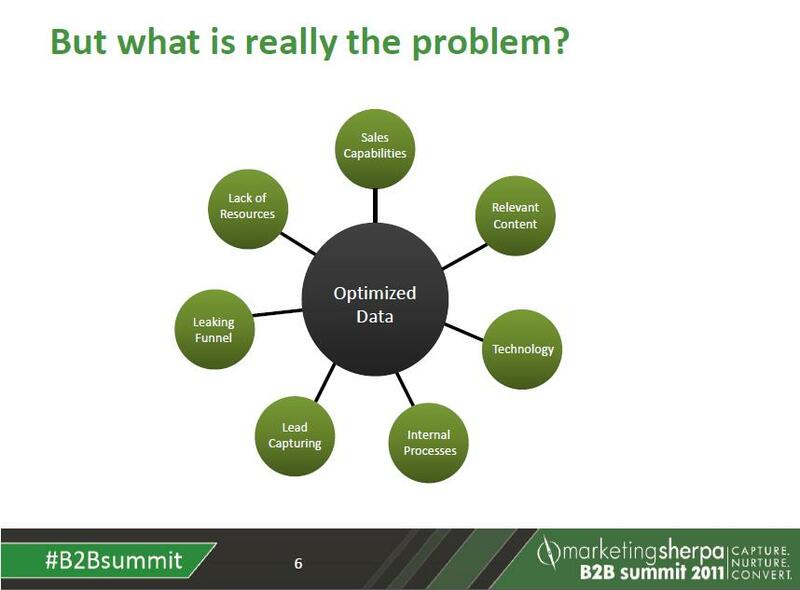 He described how seven of the most common problems that B2B marketers face have their roots in poor data optimization. We’ll go through each of these below. Several weeks ago I had the opportunity to chat with Brian Carroll, Executive Director of Applied Research at MECLABS, the parent company for MarketingSherpa, about the current state of B2B marketing, and what marketers can look forward to in 2011. Our discussion covered three main areas — the alignment of Marketing and Sales, marketing automation tools and marketing operations as new a position within Marketing — and how all three are related. For those attending MarketingSherpa Email Summit 2011 (January 24-26 in Las Vegas), Brian will be moderating a panel entitled, “How to Develop Content for Specific Buying Stages” as a B2B breakout session on Day 2. B2B marketers are being pressured to prove their value, particularly in terms of being able to contribute measurable revenue, and the struggle is that marketers are not fully in control of the process. Essentially marketers do not get to own a lead from first contact to close. Leads are generated and at some point the baton is handed to Sales to, “run the race and win,” as Brian put it. Brian said the big theme is: the alignment of Sales and Marketing will drive results from the top of the funnel to the bottom line. Many B2B marketers understand that aligning Marketing and Sales is a net gain for both departments and the entire company, and evidence of that can be found in the MarketingSherpa 2011 B2B Marketing Benchmark Report where research found that lead quality is a top priority for B2B marketers. And to go back to Marketing proving its value in terms of revenue? Brian said the key metric more and more executives are looking to Marketing for is the expense-to-revenue ratio, that is, the expense of marketing efforts to the revenue produced. According to Brian, marketing automation is not going to solve every problem, but it’s a great start to help marketers. He did caution that often starting a marketing automation effort can expose more problems than it solves. It can expose things like the weakness of the data quality marketers are using. So it’s important to remember marketing automation is a tool, but it won’t do the work for you. He said many marketers are using marketing automation mostly as an email tool, and this usage can expose the lack of a content strategy. “Most people are still doing ‘batch-and-blast’ campaigns to lists that aren’t very targeted,” Brian told me. This ties back into the alignment between Sales and Marketing, because better alignment will, hopefully, help bring about a content strategy, clarity of the value proposition, effective lead qualification and a lead nurturing process. During our talk, Brian said, “I think what’s really needed is new position within Marketing which is called ‘marketing operations,’ and what that entails is really working to understand how Marketing is interfacing with the different operational aspects of the company — including Sales, including IT, including Finance — because those are all the places that marketing needs to go to get the data points that they need in order to prove their value. He added that when marketing automation exposes problems, it will be up to marketers to really act as leaders inside their companies to teach and explain, and to not just report data, but to give real insight to the executive suite. When the CEO asks why only 1000 emails were sent to a list of over 10,000, the marketer is ready to explain those 1000 addresses were created by a high-level segmentation and that targeted list represents 70% of the revenue opportunities for the year. He thinks when marketers can achieve better alignment with Sales and are prepared to explain and lead, they will do a better job of marketing inside the company. And that will make their marketing outside the company more effective as well. Fellow marketing managers, commiserate with me for a moment. I’m sure you’ve been in a similar situation. You’re given a new marketing initiative that you know little to nothing about. For some it might be Twitter. For others, maybe landing page optimization. My intimidating hill to climb, was the webinar. While preparing for today’s MarketingSherpa webinar about email relevance and deliverability, and researching for the past couple of months on webinar creative practices, it became more evident to me that a clear marketing strategy was needed in order to produce better webinars in the future. Highlighted below are the six tactics that I found successful for creating a clear webinar strategy and currently impact the way I plan, create, and promote MarketingSherpa webinars. And if you’re a MarketingSherpa member, we even have a complimentary Sample Webinar Plan that you can download. I highly recommend you set up a launch call to review these deadlines and discuss any concerns as well as present an overall webinar outline for a suggested topic. Once you have confirmed the target dates and deliverables, you can begin to create a marketing plan. This plan should include your plans on promoting the event (emails, banner ads, social marketing) along with key dates and deadlines. The difference between a good plan and much better plan is in the details. The more specific you can be with target audience, goals, and call to action, the more effective your plan will be. When this is completed, send it to all the parties involved (including your sponsors and presenters if applicable) so they can see the plan details and discuss plan specifics. Using a number of highly targeted email blasts from in-house and sponsors lists, along with banner ads, you can bring in a significant amount of attendees. However, when marketing for our last webinar 2011 Top B2B Marketing Practices: From Lead Generation to Marketing Automation, it was the social media activity (Twitter, LinkedIn, and blogs) that drove an additional 200-250 attendees within a week of the webinar. When tweeting, make sure to begin to establish the Twitter hashtag you plan to use to live tweet during the webinar. Many companies do a number of webinars a month and using every avenue possible to create buzz is crucial to a webinar’s success. I’ve found that the sweet spot for marketing is two weeks to the day before the event. No matter what webinar platform you use (GoToWebinar, WebEX, ON24) it is imperative to learn the basics of these programs before you begin using them. Spend some time watching the “best practices” training presentations, and reading the FAQs and how-to sections many of these platforms offer. Knowing the tips and tricks of how each of these platforms function will be critical to avoiding “Uh oh” moments. Familiarize yourself with the important functions, like polls, registration questions, follow-up emails, and reminders. Also, familiarize yourself with Twitter. Establishing a Twitter hashtag, and having at least one person from your company live tweeting during the webinar, is a great way to drive conversation and interaction and also gauge the sentiment of your audience in real-time. Bottom Line: Your preparation will give you the power you need to execute the webinar and the practice will give you the peace of mind. It’s also important to review how the webinar went. Spend an additional five to ten minutes getting feedback from the speakers and monitoring the Twitter hashtag after the webinar concludes. This feedback will help you in making improvements in future webinars. BB&B Tests Mobile Link in Email: Have You? Retail email item: On August 27, Bed Bath & Beyond sent out a campaign that included a dedicated link for people who opened the message on their mobile phones. As part of my job of keeping an eye on as much of the email universe as possible, I signed up for a few BB&B segments – but not every single one of them – while registering at the site a number of months ago. Right now, classic demographics such as ‘Men aged 18-24’ just won’t cut it anymore. I’ve asked MarketingSherpa’s research team to conduct a formal study examining the changing demographics of our fair nation in the face of this seemingly endless series of economic crises. You can expect new demographic reports to appear in future Sherpa newsletters. What’s the Best Day of the Week to Host a Webinar? If you’re a B-to-B marketer who hosts lead-generation webinars, you’ve probably asked yourself that question. The most recent newsletter from webinar services vendor Bulldog Solutions offers some guidance.